Last July 2012, I was blessed to be invited to speak at both the Asiannovation Conference of the Philippine Marketing Association (PMA), and the Franchise Asia Convention of the Philippine Franchise Association (PFA). I talked about marketing innovation in PMA while I talked about premium branding in PFA. In both talks, though I presented several marketing case studies, there was a common case I presented to both groups: that of the importance of top bloggers. Consider the market research data shared by Universal McCann: website visits dropped by 16%, down to just 7 out of 10 people, from 86% 4 years ago. This trend is not just in the Philippines but globally as well. The data was supported by another study that states that consumers found bloggers much more entertaining, creative and fun to read than one-dimensional company websites as bloggers shared their personal experiences as well, rather than merely give information. In 2005, Procter and Gamble created a new position and coined the term First Moment-of-Truth (FMOT) headed by a director no less, believing that they have to win at both the store shelf (their first interaction with the consumer after they stimulate demand via advertising) and at home (where their products will be used) as the second moment-of-truth. Today, with the increasing popularity and affordability of smart phones, coupled with unlimited data offer of telecom companies, access to online information becomes a lot easier, and with practically no barrier, has taken over as the new first moment-of-truth (sometimes known as the zero moment-of-truth or ZMOT). Even the 45 year old and above consumers are now a significant force using online and social media, no longer just dominated by the 16-24 year old group as the heavy users. Just think about how vacations and business trips are booked online. Comments about airlines and hotels are reviewed online before purchase is done. If comments are positive, consumers tend to cross check other sources to ensure data veracity, however, a single negative comment may already kill a transaction. I myself dropped a hotel in China when a guest commented online that the picture of the website and the actual room are far from each other. Did I believe the website more than the stranger? A big no, I chose to believe the stranger. Another example is the rarity of complaint letters nowadays, as they have been taken over by tweets done by disappointed guests of service establishments like restaurants and banks, a dangerous move for companies with below par service. In fact, a top fashion designer and TV show judge once tweeted about the bad food quality of a restaurant owned by a top celebrity chef, which sent sales of the relatively new restaurant spinning downwards in the succeeding months. In 2011, Tumblr invited 24 major fashion bloggers worldwide to cover the New York Fashion Week (in Asia, Tricia Gosingtian of the Philippines was the only one invited); this was a strong message on the importance of bloggers. Last July 2012, SM’s premium mall, The Mall of Asia (MOA) had their annual mid-year sale but instead of getting movie or TV stars, MOA decided to go digital and tapped major bloggers to help them promote their event, highlighting their understanding of the changing market dynamics. Months earlier, Selecta Wall launched their highly successful Magnum ice cream, supported by celebrity bloggers to help them connect online. Today, you have Malaysian-based media management company Nuffnang managing the advertising revenue needs of many bloggers, big and small. It is currently headed by a new country manager, top Filipino blogger Abe Olandres, known for blogging technology and gadgets. You also have new local companies like ThoughtLeaders Inc. (full disclosure: I am chairman of the board), managing only a limited number of prized top bloggers like Anton Diaz (food & family), Tricia Gosingtian (fashion & travel) and Vince Golangco (lifestyle). Top bloggers are now celebrities, as readers follow them regularly during their chill time and talk about them in their tweet conversations. Their revenue models include banner advertisements, sponsored blogs, talent fees, event appearances or speaking fees and the like. Companies like ThoughtLeaders even have a set of Code of Ethics where their blogger-talents have to fully disclose sponsored blogs and can’t use their enormous online power to attack another person negatively. 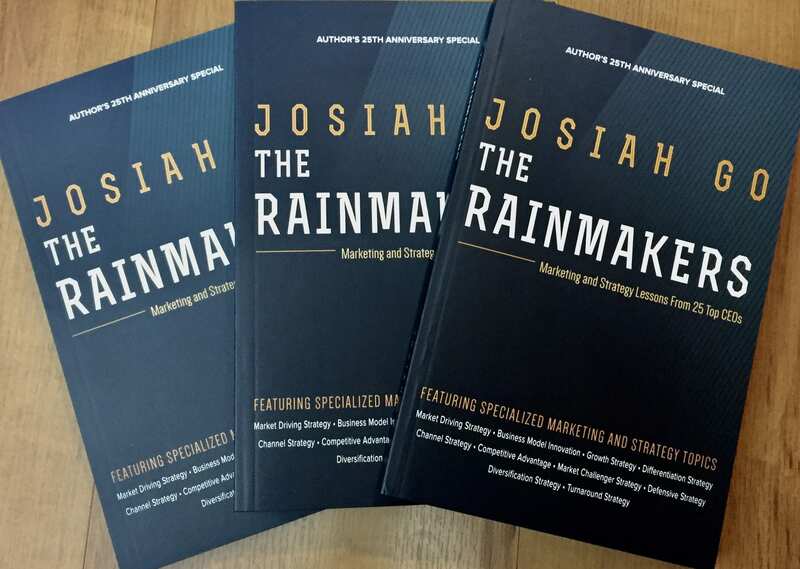 Josiah Go is chairman of Mansmith and Fielders Inc, the market leader in marketing, sales and innovation training. His 13th book “Marketing Plan in the Philippine Setting”, (co-authored with Chiqui Escareal-Go) is now no. 6 in National Bookstore’s bestsellers list. He gives marketing tips via www.twitter.com/josiahgo.